Last Opportunities at Rancho Etiwanda Estates. Final Phases - Now Selling. 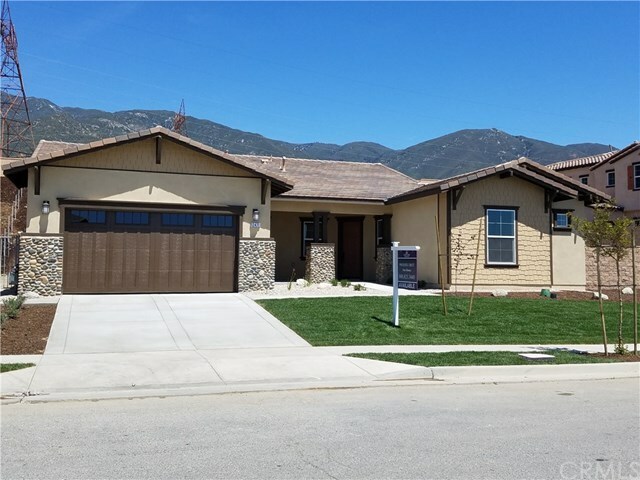 "New Home"with mountain view in Rancho Etiwanda Estates! Lovely single story home featuring 4 large bedrooms, 3.5 bath with two car tandum garage. Formal dining room, Large great room with fireplace, multi-slider doors, Nutmeg Cabinets throughout with upper cabinets at laundry room and upgraded secondary bath 2 & 3. Upgraded Quartz Counter Tops and Flooring. Upgraded Can lighting @ master & great room, upgraded counter tops, stainless steel whirl pool appliances, tank-less water heater, completely drywall'ed garage and much more. Excellent school district/gated community with city and mountain views.. Home will be ready to move in March 2018!